EARLY MORNING SURPRISE. 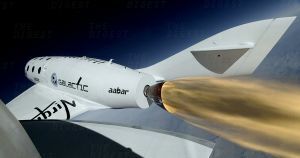 At around 6 AM PT Thursday morning, Virgin Galactic, the aerospace company founded by Richard Branson, took to Twitter to casually announce plans to test one of its SpaceShipTwo (SS2) spaceplanes. Roughly three-and-a-half hours later, the spaceplane, named the VSS Unity, took off from the Mojave Air and Space Port in Mojave, CA. About 20 minutes after that, it touched down. No livestream, no press release — just a dozen or so Twitter posts, and it was over. SUPERSONIC SPACEPLANE. Launching a SS2 is pretty different from a typical rocket launch. Instead of launching vertically, a jet-powered craft called a White Knight Two (WK2) takes off horizontally like a plane, carrying a SS2 up to its launch altitude of 15 kilometers (9.4 miles). The SS2 then separates from the carrier vehicle and flies into the upper atmosphere. Both craft later landing on a runway just like planes. For Thursday’s launch, the WK2 was named VMS Eve. This was VMS Eve’s 252nd flight and VSS Unity’s 14th, but it was only the third rocket-powered test flight for VSS Unity (in some test flights, it never separated from its carrier; in others, it separated but didn’t ignite its engines, simply gliding without power). According to Virgin Galactic’s Twitter posts, the goal of today’s test was to “gather more data on supersonic flight, aerodynamics, as well as thermal dynamics,” as well as analyze the conditions within Unity’s cabin. ONE LAUNCH CLOSER. On Wednesday, Bloomberg published a video interview with Virgin Galactic CEO Richard Branson in which he asserted the company is closing in on its goal of sending people to space. “Before the end of the year, I hope to be sitting in a Virgin Galactic spaceship, going to space,” he told interviewer David Rubenstein. If and when that happens, expect to hear a lot about it.